Preschoolers perform during the Christmas concert in a photo published in the Orange County Register. The music ministries at Los Altos United Methodist have a rich history. For more info about the history of the music program click here. Los Altos UMC is blessed with many talented musicians. There are several musical groups for all ages. Check out the latest concert schedule with all our exciting events here. SANCTUARY CHOIR, rehearses at 7:00 p.m. on Thursdays. They provide musical leadership at the 11:00 a.m. Sunday service, and present concerts and musicals for the church and community. CARILLON RINGERS, directed by Debbie Shaw, rehearse from 7:00 p.m.-8:30 p.m. on Mondays. 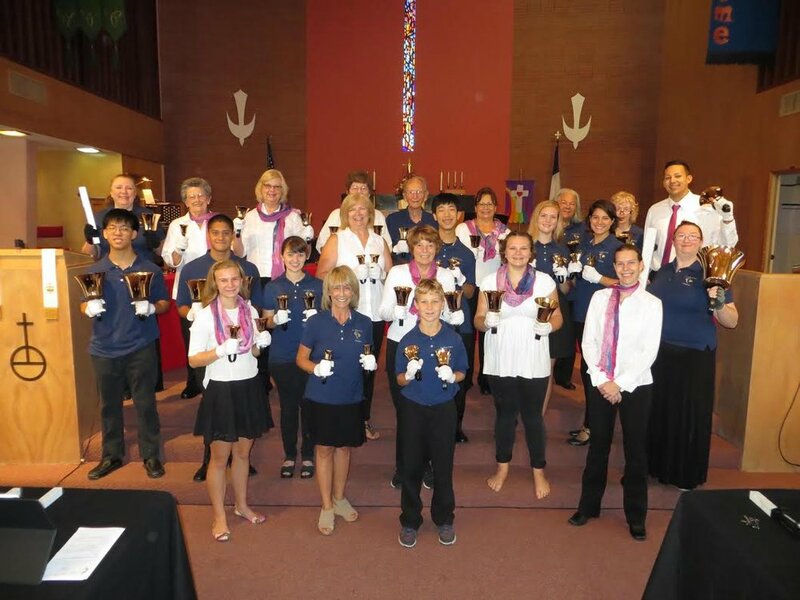 This choir participates in worship services once a month, performs in Concerts, and at special services ringing on up to 5 octaves of Schulmerich Handbells and 5 octaves of Malmark Handchimes. Carillons welcome adults and experienced youth ringers who will make the commitment to weekly rehearsals and our worship schedule. The PRAISE BAND, directed by Emilio Tello, rehearses on Sundays at 7:45 a.m. in the Fellowship Hall. The group provides music for the 9:20 a.m. worship service. CHILDREN'S CHOIR. This group rehearses on Sundays from 10:30 a.m.-11:00 a.m. and performs several times a year. YOUTH CHOIR. This group rehearses on Sundays from 10:20 a.m.-11:00a.m. and performs several times a year. In addition to preparing songs to perform, the youth learn vocal technique and introductory sight-reading. JUBILATION! BELL CHOIR, directed by Debbie Shaw, is re-organizing and will be rehearsing on Monday afternoons. Jubilation! welcomes all children & youth in grades 3-8 who want to learn to ring handbells. No prior music experience is necessary. We will learn to read music, play rhythms and have fun and fellowship while learning to ring handbells. This choir will participate in worship as they are ready to share their music, and may be invited to play in the Spring Concert. Contact Debbie Shaw for more information. EXULTATION! HANDBELL ENSEMBLE is an advanced level small ensemble for experienced ringers. Please contact Debbie Shaw if you are interested in joining Exultation!.